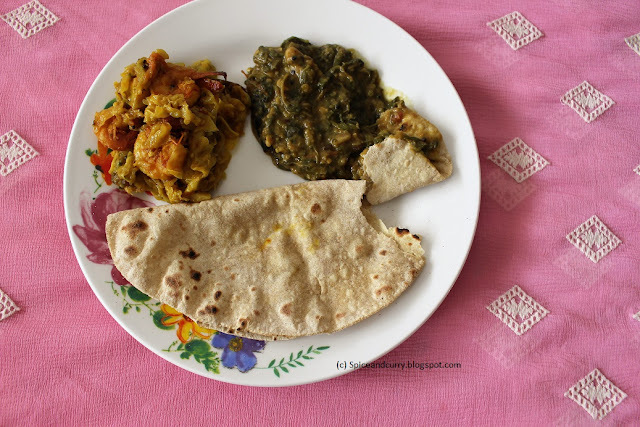 There are days when, I can only think of comfort foods and dal –roti is one such recipe which never gets ruled out and we never get bored out of it either. 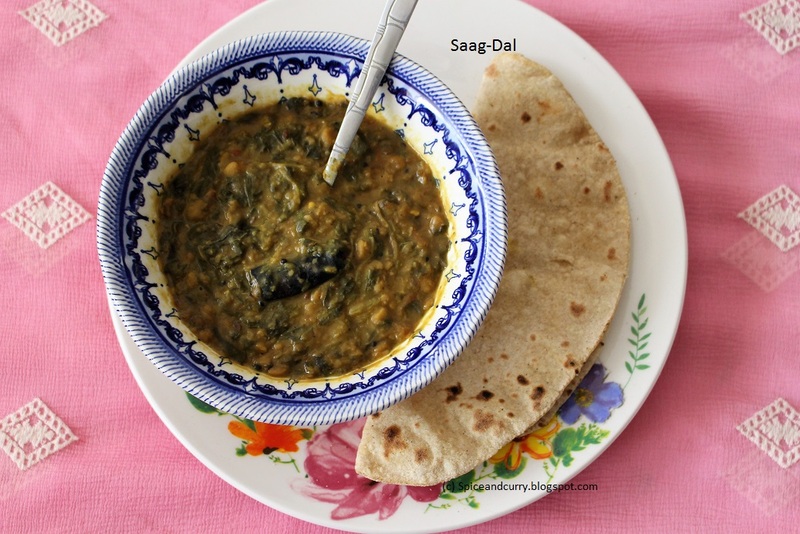 Dal- saag is adding up more greens to those ‘’everyday dal recipes’’. I have used up green amaranth leaves with chana dal+ masoor dal. 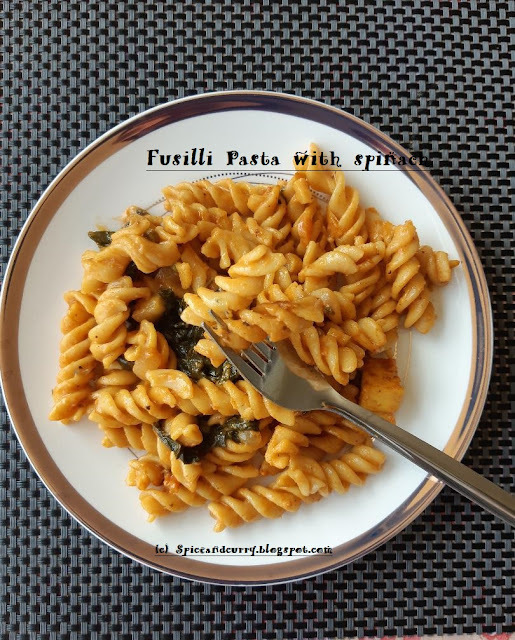 Many use spinach , some even use beetroot greens. Choose whatever you wish to, bottom line is, this is a great way of incorporating greens in one’s diet-plan. This is how we make Dal-saag – our comfort food. Soak chana and masoor dal for about 2-3 hrs in a vessel with water. Put cleaned dals in pressure cooker.Add in 2-3 cups of water.Let it come to one boil, Remove /skim off the white foam that is forming now. Close the pressure cooker, by securing the lid with whistle. Now pressure cook both dals together for 2 whistles with ample water. Let the pressure subside and then open the lid. Add more water if it turns out semi- dry. Add in turmeric powder, red pepper powder, salt and sugar. Mix well and keep aside. Now heat up a fry pan, add in mustard oil. Let it come to smoking point.Now do the Tarka/tempering. Add in cumin seeds, dry red chillies and hing. Add in chopped garlic and tomato. Add dry spices- coriander+cumin powder. Stir/fry all for about 3-4 mints at med-high flame or till oil separates out. Clean Amaranth leaves in water.Take out tender shoots and healthy looking leaves from the bunch, discard stems..
Blanch amaranth leaves separately. Add the leaves to the cooked dals ( Lentils). Let it simmer for about 8-10 mints. Add the tempering/tarka to the above cooked dals with greens. Let it slowly simmer for about 4-5 mints. Add ghee at the end. Serve and enjoy with roti or rice whatever way you prefer. Tip- You can add in some toasted cashews to the above dal or Paneer cubes as well.